I was meant to make the Braised Cardamom-Curry Lamb for this week’s French Fridays with Dorie group. However, unlike last week, I looked at the recipe with my husband and kids around me. Lamb with apples, figs and raisins! They saw the recipe and knew too much. I didn’t even attempt to convince them it would be okay. I felt tired, weak and outnumbered. I chose the safer option. 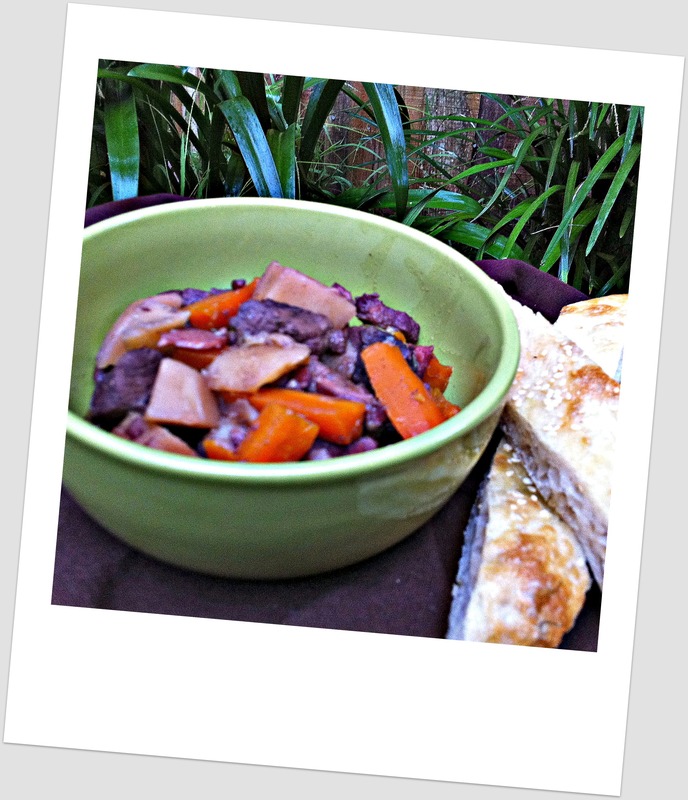 Dorie’s ‘My Go-To Beef Daube’. I joined the group after this recipe had been made and always thought I’d like to try it. The preparation was simple and the smells that filled the house were incredible. It made me feel happy, content, and filled us all with anticipation for the final product. I’ve been raised on Yugoslav “manja”, so while I found this a little bland, everyone else in my family enjoyed it. I can’t wait to read what the French Fridays with Dorie gang thought of the Braised Cardamom-Curry Lamb. Now that sounds like an intense and exciting flavour experience! Tags: beef, cooking, food, french food, french fridays with dorie, stew | Permalink. If it makes you feel any better – I made this week’s dish using beef instead of lamb. There was no way in Paducah that I was going to make lamb stew fly in our house… I was very relieved the flavors worked with beef (whew). Glad everyone enjoyed the beef daube. have a great weekend! LIke Cher, I used beef too as I had tons of it in my freezer. That’s so funny about your family spotting the ingredients for the braised curry lamb…that’s why I try to sneak my French Fridays cooking for when the kids are busy doing other things :-). Your beef daube looks lovely, I’ve yet to try making this and reserving it for a day when I absolutely cannot make a stipulated FFWD recipe because the family thinks it’s “weird” or something! Ha! As much as I want to try this lamb dish, I’m feeling a bit under the weather and won’t be able to make it in time. Your daube looks much tastier than the lamb probably does. This one is still on my to do list as well. Hopefully I’ll get to it later this winter. Thanks for the preview, certainly looks tasty.